It is an axiom of the gems trade that the finest ruby in the world comes from Burma. But the reality is that very little ruby at all is coming out of Burmese mines these days. Almost all of the ruby currently produced from Burma is sub-carat size stones from the Mong Hsu deposit in the Shan state. This material tends to be purplish in color and requires heat treatment to reduce the blue component. The large Mong Hsu deposit, though mostly depleted, is a fairly recent discovery, dating back to just 1992. The region famed for the very finest rubies is the Mogok Valley, located about 200 km northeast of Mandalay in northern Burma. It is believed that ruby mining here has been active for more than a thousand years, and this is the source of the rare "pigeon's blood" ruby. The best Burmese rubies have a fully saturated red and a unique fluorescent quality. Fine quality Mogok ruby does not require any heating to display a pure pigeon's blood red. Production from Mogok has declined significantly, especially in the last five years, and fine Mogok rubies in larger sizes have become so rare that they are beginning to take on the mythic status of Kashmir sapphires. Mogok rubies over 5 carats are especially rare, and most that exist were mined many years ago. We recently acquired a very special 5.46 ct Mogok ruby from an estate sale. Completely untreated, this extraordinary gem is a pure pigeon's blood red with full fire. It has been certified by both the Gubelin Gemlab and GemResearch Swisslab (GRS), with both labs issuing special reports on this rare stone. Very rare combination of size over 5 cts, color variety ("pigeon's blood"), excellent brilliance and transparency, and absence of heat enhancement. Burma has long been recognized as the locality associated with the most desirable rubies in the world. Within Burma (Myanmar), the most famed region is the Mogok Valley, or Mogok Stone Tract, in the Katha distric ... Mogok-type rubies typically possess a red body color and red UV-fluorescence. In addition, they may contain tiny amounts of light-scattering rutile silk and a swirl-like growth pattern. It is this combination of features which gives these rubies their characteristic appearance. In the last year, fine unheated Burma rubies over 5 carats have drawn strong interest at auction. A 6.04 ct cushion-cut Burma ruby drew a world-record price of USD $551,000 per carat ($3.32 million) at Christie's Hong Kong in 2012, while an 8.88 ct oval Burma ruby sold for $324,000 per carat ($2.87 million) at Christie's Hong Kong in May 2013. Click here to view the complete lab reports on this extraordinary gem. This month we feature new acquisitions, including a a rare 27 ct sphalerite from the Aliva mine in Spain, a superb 5.95 ct blue-green tourmaline from Mozambique and a very fine 2.71 ct unheated Ceylon sapphire. An outstanding large sphalerite from the Aliva mine in northern Spain. 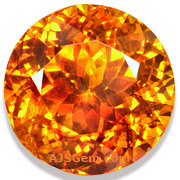 This gorgeous round sphalerite is over 16 mm in diameter and displays a rich cognac color with amazing fire. Beautifully cut and very clean, this is one of the finest sphalerite specimens we've seen. 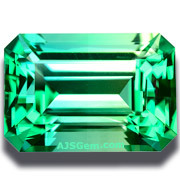 A simply exquisite tourmaline with lovely gradients of blue and green that change as the gem is turned in the light. Superb clarity and perfect cutting bring out the brilliance and luster of this fine material. 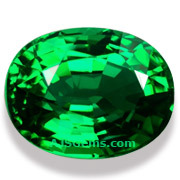 A very fine gem for a special ring or pendant, and a wonderful gift for the serious tourmaline collector. A gorgeous deep deep pink, this fine sapphire is nearly (but not quite) red enough to be classified as ruby. Very fine crystal from Madagascar, this gem shows full fire and scintillation. The color is simply luscious, and the superb clarity and excellent cutting make this an extraordinary stone. 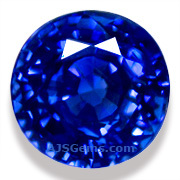 A rare unheated Ceylon sapphire with top color in a substantial size. The color is the classic Ceylon royal blue, rich and vivid. The crystal is very fine, and we've graded this gem as "almost loupe clean." All of this, in a hard-to-find round shape. This is a superb gem, suitable for an engagement ring or other important jewelry. This is a stone you will keep in your family for generations. Certified as natural and unheated by Tokyo Gem Lab (TGL). A gorgeous chrome tourmaline with a bright open color and full fire. Very clean and well-cut, this is as fine a chrome tourmaline as you will see in the 2 carat size. Guaranteed natural and untreated by AJS Gems, Bangkok. 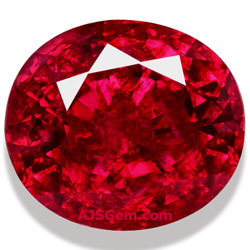 A bright and lively rubellite with very good clarity for rubellite. Excellent color saturation in a rich purplish-red. Beautifully cut and polished. The Mogok valley has been closed to tourists for many years, with the exception of a brief period of liberalization in 2000-2003. Even then it was very difficult to get permission from the government to enter the area. Now the Myanmar government is opening up Mogok to tourism, though travel permits for the area will still be required. Tourists will also be required to have a registered tour guide. Since there are very few hotels in Mogok, the lack of tourist infrastructure will keep mass tourism at bay for a while. Last April the Arusha gem show in Tanzania was successfully revived after a 12 year hiatus. This year the Tanzania Mineral Dealers Association didn't quite get the show together for April, but they plan to hold the exhibition at the Mt. Meru Hotel in Arusha from October 28th to 31st. Other countries planning to participate in the 4 day show include Mozambique, Madagascar, Kenya, Ethiopia, Zambia and Namibia. Many gem-producing countries attempt to restrict the export of uncut stones, hoping to increase their revenue by adding more value to the product. But setting up cutting facilities that can keep pace with mine production is a challenge. The Ethiopian Ministry of Mines has now decided to lift their ban on the export of rough opal, effective Sept 30, 2013, according to a notification we received from our friend Yared Mulugeta, Vice Chairperson of the Ethiopian Gem Association. The gem-testing probes from companies like Presidium can be useful for separating diamond from cubic zirconia or moissanite, but they are not very successful in identifying colored gems like sapphire, spinel, topaz, garnet or tourmaline. The reason is that these probes test for thermal conductivity (or electrical conductivity in the case of the moissanite testers), and colored stones are not well differentiated by thermal conductivity. In any case, these electronic testers cannot distinguish synthetic gems from natural for either diamonds or colored gems, so they are not a substitute for proper gemological testing. Rhodolite is a mixture of almandine and pyrope garnets. It has a hardness of 7 to 7.5 on the Mohs scale. Its color ranges from rose red to raspberry red, and purplish-red to purplish-pink. High grade material ranges from eye clean to loupe clean. It is brighter than the common red garnets and without a trace of a brown secondary hue. Most high quality rhodolite is currently coming from Africa, especially Madagascar and Tanzania. Rubellite, a type of tourmaline, can often resemble rhodolite garnet in color. 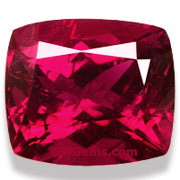 But the finest rubellite has an intense color saturation that is one of the marvels of the gem world. Though rubellite has about the same hardness as rhodolite, even the finest rubellite tends to have inclusions, and "eye clean" is considered a high clarity grade. Rubellite is rarer and more valuable than rhodolite, with rubellite prices per carat typically 2 to 4 times higher. 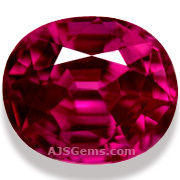 The leading sources for high quality rubellite are currently Nigeria and Mozambique.